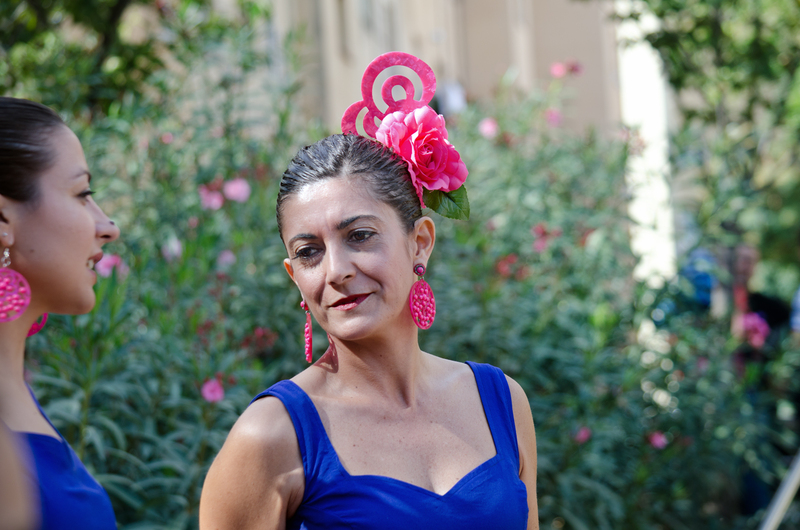 This portrait picture of a dancer wearing colorful earrings and flamenco headpiece is yet another sample of how Spanish culture is preserved by local authorities in neighborhoods around Barcelona in their attempt to reflect our reality, a concoction of different regions, different people living in the same peninsula under a flag some share and others do not, with their peculiarities, their traditions and their folklore. Some inhabitants feel identified with flamenco, some others remain indifferent and the rest rejects everything that has to do with it, basically because of that cliche that relates Spain with just bullfighters and flamenco dancers or in many other cases because they are not Spaniards at all but Catalans. But in spite of all these contradictions that you do not see when you are a tourist and come here for the first time, Catalan traditions coexist with these cultural manifestations of other regions and once the show starts, politics and legitimate or not feelings of belonging to one nation or another, to one region or another on both sides are left aside. When I look at this image I just see a beautiful girl wearing a colorful headpiece, having a wonderful day at the party showing people what she does best, dancing flamenco. Hi Carlos, interesting post. I guess it's a complex situation which I don't fully understand. Thanks Duncan. Hope you enjoyed the weekend too! Yep, it is quite difficult to understand if you don't live here or at least it has many interpretations according to which side you take. It has to do with history, not just during Franco's dictatorship but long before. What I can tell you is that there are some people born in Catalonia that feel Spanish, some that feel just Catalan and some that feel Catalan and Spanish. As you can guess getting all of them to agree on some delicate topics is almost impossible. Present crisis and the unfair treatment that Catalans have been receiving by the central government in Madrid or at least their failure to realize that some autonomous regions contribute more than others and so deserve bigger budgets. Their tendency to centralize instead of delegating more power to autonomous regions like Catalonia creates a feeling of abandonment, of neglection by the State something which has been exacerbated by the indebtedness of our public institutions, the drastic cuts in social investment, increasing unemployment and poverty. With this scenario it is not strange that people want to find solutions. Many believe that by creating an independent nation from Spain Catalonia would develop faster and would build a solid economy, that aside from the fact that among them a considerable amount feel Catalan and detest everything Spanish yesterday and at present. I know that at the moment there are people that feel Spanish and Catalan that also prefer to be independent because they are simply fed up. Of course many think this is just a crazy idea and are perfectly comfortable with the idea of Spain as one nation gathering all autonomous regions. Taking sides is not objective of this blog. I leave it up to visitors to interpret and jump to their own conclusions. I am human you know, citizen of planet earth. Life is too short to waste time in flags, motherland and national anthems. Call me an antisocial if you want to. It's my choice.